She is your heart walking outside of your chest. He means the sun, the moon and the stars to you. You fight to break the chains and labels, to raise awareness of the injustices. This mug helps you keep that fight in the open because anyone seeing it will quickly remember your fight or ask about it. Record your own short message or have your little record something they need known. Get your message across to anyone willing to take a moment and scan using a QR Reader (available free in the App Store for most phones) that many people already have installed in their phones! 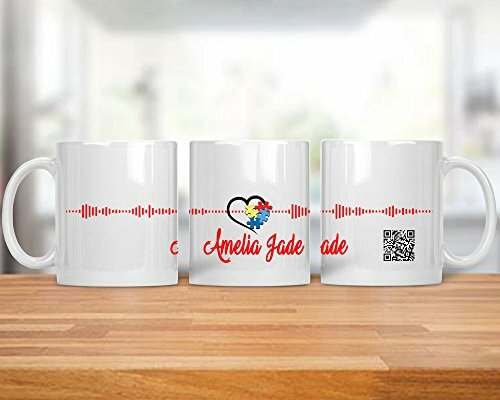 Record your message via Voice Memos on your phone and email it to us and we will create not only the QR Code but the unique soundwave pattern unique to your message! Grandma, grandpa, aunts, uncles and siblings love to show their support to so be sure to get one for the whole family! Creating your message is very simple. You will record it using your voice recorder on your phone (a standard app on all phones) then you send it to us via message. This mug is an 11oz mug and the design wraps around all three sides as shown. Top rack machine washable.